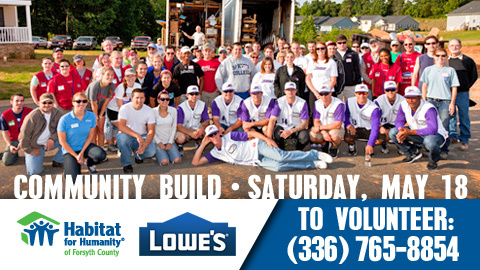 WINSTON-SALEM, N.C. (MAY 7, 2013) - The Winston-Salem Dash will partner with Lowe's Home Improvement and Habitat for Humanity of Forsyth County to assist in the annual Community Build on Saturday, May 18, from 7:45 a.m. to 2 p.m. Dash players, staff members and front office team members will join volunteers from both Lowe's and Habitat for Humanity in the construction of five houses at two separate locations in the Winston-Salem area. The build project is truly a community effort, so Dash fans are encouraged to help, too. To register as a volunteer, call Habitat for Humanity of Forsyth County at (336) 765-8854. Everyone's efforts will be honored during the Dash's game on Saturday, July 27, at 7 p.m. A special video will be shown at BB&T Ballpark in dedication to this year's Community Build.